Halfway through the Dufferin Islands loop in the area used for picnics in the summer you will find, the Sylma, this iconic display is twenty feet tall and has a diameter of thirty-five feet. 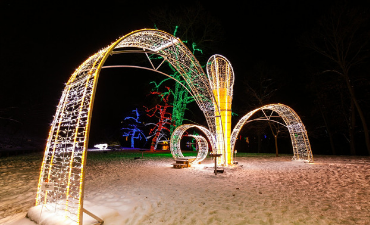 Visitors are invited to walk into the display underneath its arching strands. At the centre of the Sylma is a magnificent central pillar lights, there is also a platform within one of the displays loops that visitors can stand on for a great photo opp.